NOTIFICATION LIST – Join Now! Join our Notification List and you will be informed first of all upcoming specials via SMS or eMail! 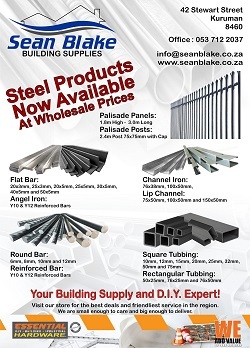 Sean Blake Building Supplies has been serving the Northern Cape community and greater Kalahari region since 1985 and as a valued member of the Essential Group you can be sure to get the best products and service in the region. We specialize in all your building supplies and roofing needs whether you are a building contractor, a handyman or just a D.I.Y. enthusiast, we have everything under one roof. 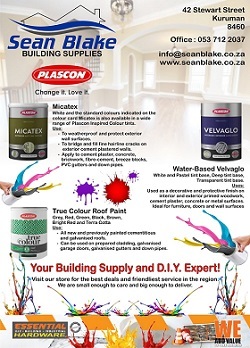 At Sean Blake Building Supplies we do cater for large projects but we are small enough to value every client’s needs individually and strive to fulfill all your needs professionally. We supply only high quality and reliable products from all the leading brands that you can trust and count on, and if we don’t have it, we will get it! Whether you need new garden tools, hand or power tools or a new fitting for that leaking tap, we have what you need and much more at prices you can afford. Our ITC accredited roof truss plant manufacture timber roof trusses of the highest standard and according to all SABS and building regulations. We supply timber roof trusses to large development projects and to the small contractor in need of a secure and durable roof. Sean Blake Building Supplies is just one of the almost 200 member stores in the Essential Group, but what does it mean and how does it benefit our clients? What is the Essential Group? Essential Hardware consists of entrepreneurial independent Hardware, Building, DIY and Industrial retailers who have joined a National Brand as Member stores. Essential is a nationally recognized brand throughout South Africa with a number of stores in Namibia, Lesotho and Swaziland. How do you as client benefit from it? Independent store-owners such as Sean Blake Building Supplies & Roof Trusses recognized the need to align themselves with a National Brand in the face of the threat of big box chain stores entering the communities they serve. Essential Hardware is well matched to those retailers that want to retain 100% of their independence, gain access to excellent suppliers who offer regular national special deals, world class advertising tools and a team of Essential Business Consultants (EBC Team) to assist stores operationally. All in all it ensures that we can provide our clients with the best products at the best price and it ensure that when you are visiting our store you will feel at home and enjoy your shopping experience. It also ensures that our staff can assist you much better and more professionally since they know the products and services. Come and visit us today for a hardware and building supply shopping experience you will find now where else.